This piece has been in development for some years. 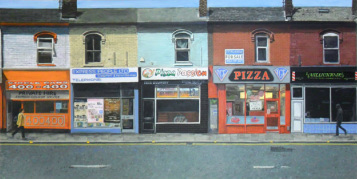 Having been inspired by the both ‘colourful’ and ‘run down’ appearance of Mill Street in Luton. I liked the combination of excessive and often inappropriate typography plastered onto its Victorian buildings base. The buildings on the other side of the road prevent a viewpoint as depicted here – and so to abstraction. I decided on this flat look as though it is some sort of technical drawing elevation or architect’s visual. First thought this would be appropriate for Luton Art (being a Luton scene) a couple of years ago. Had a nice long format canvas – but thought that the detail would be too small and difficult at 300mm x 600mm to achieve in the time I had then. Ultimately I undertook “Luton Pigeon observes progress on guided busway” on this very canvas. The project stalled as I was convinced I should save the idea for a 500mm x 1000mm canvas. I’d re-photographed some of the buildings subsequently (seeing the taxi office without a parked car in front was a rarity) and again when the project became live again for this year’s Luton Art. This reference material was interesting as several of the shops had changed hands or fallen into disrepair. I mixed up the ages to create a street scene that never was. – It looks possible and is certainly representative – but I guess that’s the job of art to re-interpret rather than just catalogue. Hopefully future historians will never use this as a statement of fact! I added the figures to bring some tension into the piece. The chap on the right was actually present on the street – just further along. The lady was never there, having been photographed somewhere in central London. I wasn’t aiming for menacing particularly – I hope people will interpret the image as they feel appropriate; and certainly I don’t want to add to the often negative vibe we get here in Luton. I originally came up with “Mill Street Blues” as a title for this; but thought this too ‘clever’, so “Meeting Point” was used instead. On 10th July 2016, I renamed this work "Mill Street Blues". So there!